In this podcast episode (and in the show notes summary below) I dive into some the top rookie canning mistakes with information on how to learn more. I truly believe that preserving food can be an important part of living an organic, seasonal lifestyle. And the key is to know how to capture seasonal flavor at it’s peak AND to do it safely. So this week, I share some of the things that can prevent that from happening. The 4 mistakes outlined below are part of a larger list of 8. You can get the full list by clicking the links below to download the full PDF. There are a lot of ways this can happen in canning and even in cooking. But by far the biggest way that flavor gets covered up (specifically in jam and jelly making), is with too much sugar. If you have ever made a traditional jam or jelly recipe with a commercial pectin, you know that it always calls for a LOT of sugar. 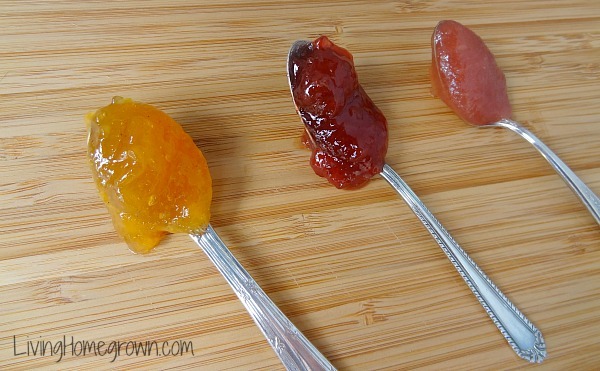 And this is because you need a specific ratio of pectin, sugar and acid to get “the gel”. In other words, you need a delicate chemical balance in that mix to get the jam or jelly to firm up when you cook it. Otherwise, you end up with fruit syrup and not a jam/jelly. But many times, all that sugar covers up the exact flavor you are trying to capture! And you can end up with a preserve that tastes like sugar rather than fruit. There are several ways around this, but the one thing you can NOT do is just reduce the sugar of that recipe you are following. To do so would throw off the balance and you might not get the gel. Instead, you need a different recipe…a low/no sugar recipe. You can get that with a commercial low/no sugar pectin or you can get that with a canning technique that involves using temperature instead of pectin. But either way, you can make a choice toward a different recipe that does not rely on sugar to get the gel. And when you do THAT, you end up with a preserve that shows off that fruit flavor instead of the sugar flavor. Another place where people cover up flavor is by over using spices and herbs. They add “a little something” to the preserves and end up overpowering the flavor of that produce. The best way to use herbs and spices in your preserve making is as an accessory to the flavor. So you use a light hand and let the natural flavors of the produce shine. Takeaway: Think of the flavor you are trying to showcase with every batch of preserves. If you are making a jam or jelly, consider switching to a low sugar recipe. If you are adding some herbs and spices to a traditional recipe, go easy on your first round. Be mindful of what you are trying to achieve with that batch. Open kettle canning is when you seal your canning jars without actually processing them. And it can happen accidentally or on purpose. Either way, open kettle canning is NOT okay to do. But before you get the jars into the canner, you notice that they sealed themselves. In other words, you have made a vacuum seal on those jars before they were actually processed in the canner. And you may wonder…hmmm…do I even need to process them now? The answer is YES! You still need to process them! The act of processing those jars (in either a water bath canner or pressure canner) does a lot more than just create the vacuum seal. It also guards against anything growing in that jar later. It’s a safety issue. In addition, the vacuum seal of an open kettle sealed jar is rarely as strong as a vacuum seal created within a canner. Having a strong seal means a safer jar and a longer shelf life. So, open Kettle Canning is simply getting a seal without actually canning and it is not considered a safe practice. Takeaway: Do not open kettle can your preserves. Always process your jars in either a water bath or pressure canner and do not just let them cool without processing. If you ever discover that your jars have inadvertently sealed on their own, just keep right on going with your process. That “open kettle” seal does not mean you’re done. Want the FULL list in PDF form? A “quick pickle” is a pickle that is not fermented. 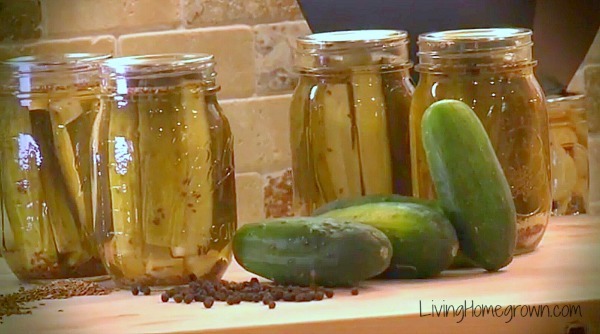 It’s pickled using vinegar; which is a faster process than fermenting – hence the name “quick pickle”. Pickling salt (canning salt) is a salt that has no additives. It doesn’t have any anti-caking agents or any iodine. It is just pure sodium chloride. If you pull your standard household salt off the shelf and you look at the label, you’ll see that it has other ingredients besides sodium chloride. And one of those is usually the anti-caking agent. Now an anti caking agent doesn’t hurt us in any way and it does not make our pickles unsafe. But it can make your pickle brine (or the liquid those pickles sit in) cloudy. The reason it’s in the salt to begin with is to make that salt pourable. 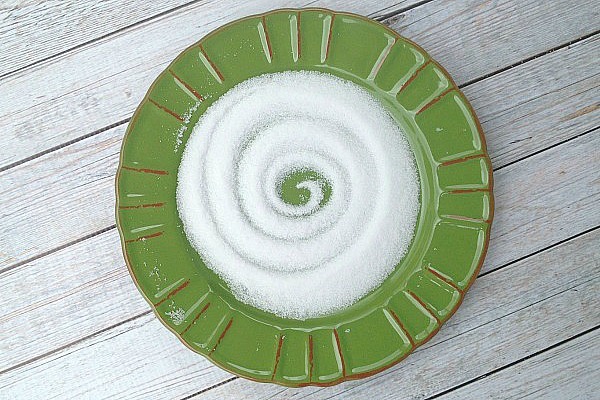 Normally, salt will draw moisture out of the air and it would eventually get clumped up and not pour properly out of your salt shaker. So the anti-caking agents are there to keep it pourable. But when used in pickling, that anti-caking agent can make the brine cloudy. There’s nothing harmful in that. But it doesn’t look too appetizing. The other ingredient you might find in standard table salt is iodine. Again, iodine does not make your pickles unsafe. But that iodine can make some pickles turn dark, which is also unappetizing. So in both cases, using a pickling salt will give you something that looks more appetizing. And after all your hard work, that is what you want! Takeaway: To have your quick pickles look their best, always use a canning salt (or pickling salt). The ring can inadvertently hold a lid on the jar that has a broken seal. So, if the vacuum seal is compromised, that ring may make it LOOK as if it is okay when it’s not. Then later, when you pull that jar off the shelf and open it, you may or may NOT be sure if it was sealed. And depending upon how long that jar has been unsealed, you may not notice that the food is going bad. Leaving the ring on can lead to rust build up, which can stick that ring onto the jar like cement….seriously. It is as if it is glued on! Then later as your try to open that jar with the stuck ring, you can break the seal on the jar. Or was the seal already broken?? Hmmm…Reason number one comes back to bite us again. We don’t know if we just broke the seal or if it has been unsealed for a long time. The ring can hold particles of food that came out (siphoned) during processing. As that food sits against the lid, it begins to grow mold. This mold can push on the edge of lid and break the seal. Takeaway: Store all jars without the rings. To rest assured that your jars are sealed while sitting on the shelf, you should remove the rings before storing them. Then later when you pick up that jar, you can clearly see if the jar is still sealed. 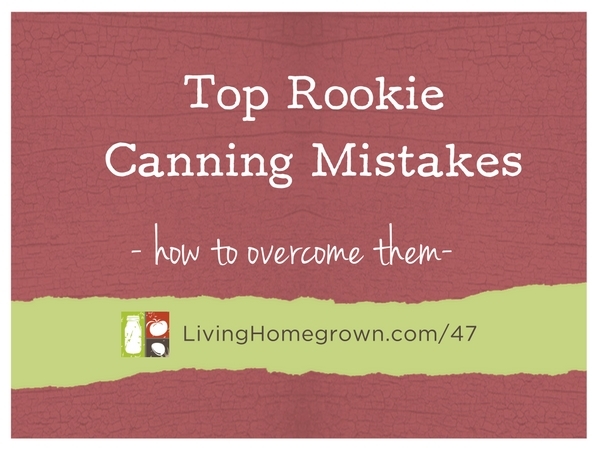 Want to learn MORE Rookie Canning Mistakes? If you want to dive in ALL the way, my Canning Academy® is the course for you. I only open the doors a few times a year. So, be sure to CLICK HERE to get on the wait list if you might be interested. Enjoy this list of Rookie Mistakes? There are simple social media share buttons below. Thanks so much. Theresa Loe is the founder of Living Homegrown® and the Canning Academy® and is the Co-Executive Producer & Canning Expert on the national PBS gardening series, Growing A Greener World®. Theresa homesteads on just 1/10th of an acre in Los Angeles with her husband, two teenage boys and several disorderly but totally adorable chickens. Learn more about Living Homegrown here and about the Canning Academy here. Excellent information! Thank you! So many people leave the rings on. They think it makes sense. Now I can better explain to them why it’s important to take them off. 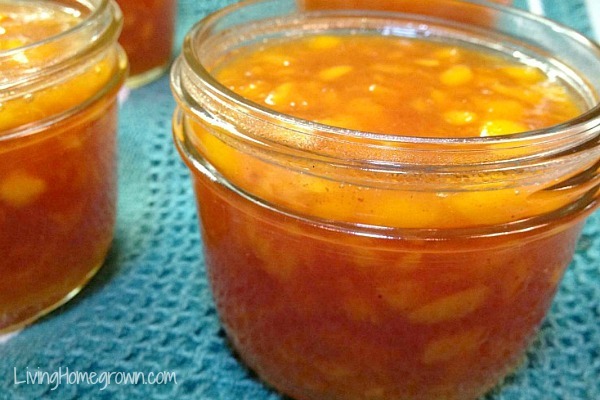 Have you tried making jam with homemade pectin? I’ve experimented a few times making my own pectin from apple skins and cores (minus the seeds), but haven’t had a lot of luck getting the ratio to sugar and acid right. Sometimes my jams jell, sometimes they’re syrup. Any advice? Ugh! That is so frustrating Amy! I wish I had a magic method for ALL sticker residue, but I do have a few tricks up my sleeve. Note: Using a green scrub sponge helps speed up the process on really stubborn spots. I have found that the “stick’em” of different labels responds differently. You have already soaked in warm soapy water. That is usually my first go-to method. I soak overnight in Dawn Dish liquid (it works better than some of my other brands). It only works (as you said) when the labels are not baked on or when they are water soluble. But IF that doesn’t work, I let the jar dry and I try fingernail polish remover. It is acetone and sometimes cuts through certain labels. If THAT does work, break out the blow torch. One of those 3 methods usually work. Give ’em a try and let me know. I know there are commercial products on the market, but I haven’t tested them yet. Great advice! I knew you would know some tricks.. I am going to give the coconut oil/baking soda method a shot. I have never tried that one. Thanks for sharing!